We all know Aristotle A. Avinroo, also known as AAA, that small and big headed Blumaroo, addicted to games, the master mind behind Daily Dare and Games Master Challenge. 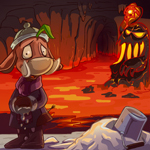 We’ve all been told to defy his terrific scores in the past and sometimes he’s needed a little help from us, ordinary and non-magnificent Neopians, as in Dungeon Dash, where we helped him and his little sister to escape from King Roothless’ dungeon. On year 18 a brand new game featuring AAA was launched, this time around, AAA is looking to take his toll against King Roothless and he’s needing your help to frustrate Roothless’ sleeping time, but how?. Something deadly and sneaky that will allow attacking from the shadows…Hmmm… Yoyos of course! -As I already said before, you’re playing as AAA and you start with 2 yoyos, the game’s objective is to hit King Roothless with your yoyo so he won’t fall asleep. -You move around the room using the left and right arrow; Right arrow moves AAA around the room clockwise and left arrow anti-clockwise. 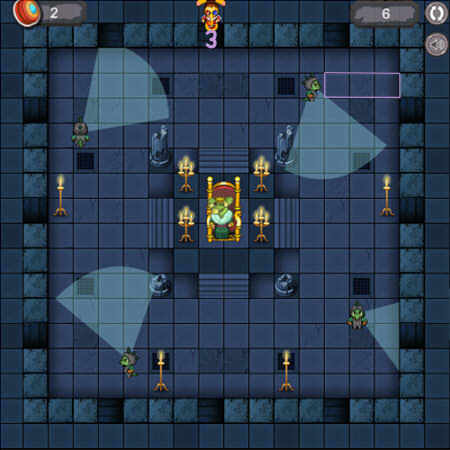 -Pressing the space bar will make AAA shooting his yoyo across the room towards King Roothless’ throne, which it’s exactly in the middle of the room. 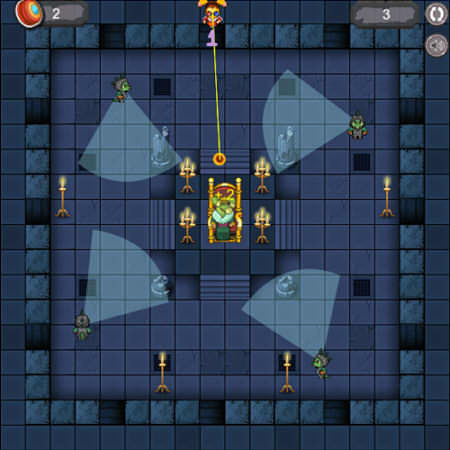 -The guards walk around the room with their flash lights and you must avoid shooting within their flashlights’ area or you will lose a yoyo. - Hitting King Roothless with your yoyo awards +1 point the first time it hits Roothless, if you manage to hit him again within the next second, you’ll get +2 points; you will gain +1 point for non-consecutive hits. - Hitting King Roothless from the same gap three times in a row will make a blinking red shield appear in such gap, you can make it disappear by hitting Roothless from a different gap. If you hit him a fourth time from the same gap, that will make the blinking red shield to become solid and the only way to get rid of it is by hitting it which will cost you a yoyo. -You have 15 seconds span between hits before King Roothless yawns; once he yawns you only have 5 seconds to hit him before he falls asleep, which would be a game over, no matter how many yoyos you have left. Losing all of your yoyos is also game over, obviously. -There are bonuses in the game that will appear randomly during your game, all of them award you +1 point and different effects; you can collect them by hitting them with your yoyo. If you collect the yoyo, it will grant you one extra yoyo, collecting the present will award you +10 points! And finally the snowflake will freeze the guards for 5 seconds. So now that the gameplay, controls and scoring system was explained, let’s go to the best part of this guide, that’s right, the strategy to master this game! Probably your highest score must be less than 100 points, but don’t feel embarrassed because that might change if you practice what will be written in this section. You are wondering what those red arrows and purple numbers mean, right? First of all, you might think guards walk around the room randomly but they don’t, in fact they follow the same pattern when walking around the room, that’s what those red arrows mean. To make this easier for you, we’ll focus on the guard circled, so you won’t get lost with the following explanation. Each guard follows his own pattern, as I previously said, the one we’re working with will walk on the upper part of the room, back and forth; you need to understand how he moves in order to throw your yoyo through those gaps safely without losing any yoyo. The bigger arrow means that the guard will reach the left corner completely and he’ll only reach partially the right corner. The importance of this is how much time you have to throw your yoyo before the guard’s flashlight might reach you. Now the numbers mean the order in which you have to throw your yoyo, you will only play on the upper part of the room and use those gaps, so you will throw your yoyo first through gap number 1, then gap number 2 and so on. Let’s break down the order of the numbers so I can make myself clearer. Step 1. 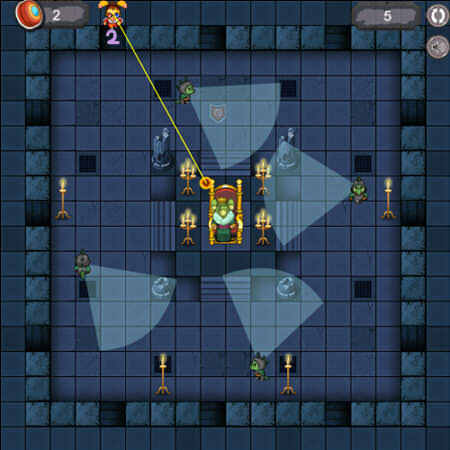 You’ll start the game positioned over gap 1 (Step 1), throw your yoyo 3 times in a row quickly when the top left guard’s flashlight is pointing downwards, don’t worry he won’t reach your yoyo; now you have started! Once you have hit Roothless three times from gap 1, the blinking shield will appear and it’s time for you to place AAA over gap 2. Step 2. Now you’re over gap 2, wait for the guard to walk away from the left corner and as soon as you see his flashlight move away from your path, throw your yoyo through gap 2, you might require a little of practice to time your yoyo correctly, so the flashlight won’t reach it when it goes backwards. After hitting Roothless from gap 2, position AAA over gap 1 again. Step 3. 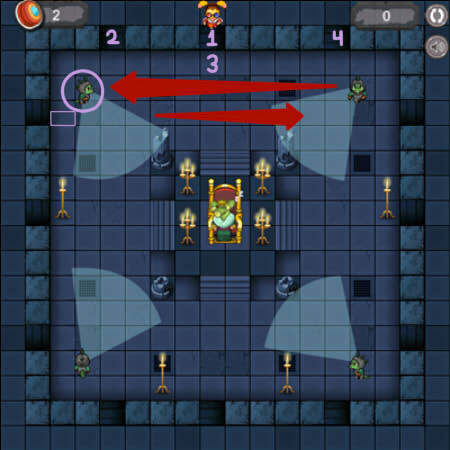 Once again you’re over gap 1, you can throw your yoyo only 2 times; notice how in this screenshot the guard is 3 squares away from the right wall, so he’ll turn around again sooner and you’ll have less time to attack from that gap, so be quick. Unlike when he’s going to the left, where he will be one block away from the left wall (See screenshot 1) and that gives you more time to attack. Step 4. And finally after hitting King Roothless 1-2 times from gap 1 (Step 3), position AAA over gap 4 and you’ll have to time your shot like you did on step 2. Following these sequence Roothless will never fall asleep or even yawn and you’ll be able to advance in the game without many struggles, instead of going around the room finding random gaps to attack and running out of the time most of the time. Once you hit from gap 4, go back to gap 1 (Step 1) and repeat! Now that you have the basic strategy, guess what? You’ll have to do the same 4 steps over and over again until you reach the desired score. If you manage to do those 4 steps without any problems, you’ll reach the top score (1000 points) pretty fast. Anyway, there are some things you have to take into consideration so your game will be even smoother. -After scoring around 50 points, the game will speed up, this is important for you to remember, why? Because that means the guards will move faster giving you less time to attack and you’ll need to be faster as well, on step 1 and step 3 (When attacking from gap 1) You’ll probably only be able to attack twice and once respectively after it speeds up. This speeding is pretty obvious so you’ll know when to adjust your timing. -Always avoid creating the solid shield because you’ll lose a yoyo if you want to recover that gap. -Bonuses drop randomly during the game, I would recommend you to only collect the presents and extra yoyos; it doesn’t really matter if you collect the snowflakes because that might affect your pattern and mess up with your game. When you go collecting a bonus, after picking it up, go back to your routine and restart according to where the guard is; if you left on step 2, when you go back, you’ll probably be on step 3 or 4, don’t lose the rhythm of the game. -YOUR PATTERN MIGHT CHANGE DURING THE GAME. Yes, it can and yes, it will. I’ve had changes on my pattern 3-4 times per game, so it’s not a big deal. By changing the pattern i mean that the guard will get closer to the opposite wall he used to; for example in the beginning i told you that the guard will be 1 square away from the left wall and 3 squares away from the right wall, this will change a couple times throughout the game, so at some point the guard will be 1 square away from the right wall and 3 squares away from the left wall; the only thing you need to do is inverse the 4 steps and if it goes back to the original pattern, you just change back the steps as you were playing in the beginning. -You might want to turn on your sound, sometimes when picking up a bonus, i kind of forget about Roothless and as soon as i hear him yawning, i search for the closest gap with a safe path to hit him before going back to my pattern, otherwise your 5 seconds before he falls asleep might end and your game will be over. 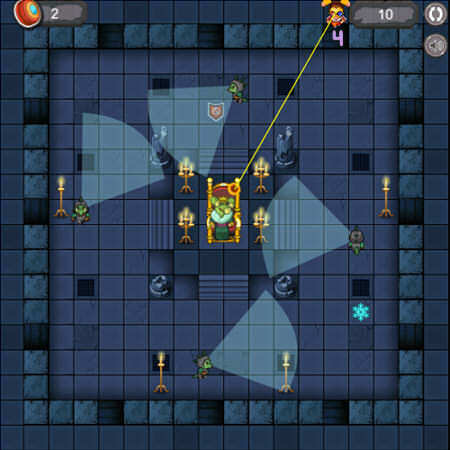 -Lag is your worst enemy with this game; a couple of second of lag might affect your game a lot because your yoyo will take longer to reach King Roothless and the guard’s flashlight will for sure reach you, so close any other tabs that could slow down your game. If you’ve reached this section, it means you already know the secret to a high score; you just need to practice this strategy and get the hang of it. Currently the top score for this game is 1000 points (a few points more if you finish the game collecting a present bonus). Once you master the game to reach that point, it will freeze, you will need to click on the restart button on the top right corner of the game window and then click on Roothless’ lap where the submit score button is supposed to be. Practice makes perfect, my Neopian folks. You might even win a shiny trophy and once the avatar is fixed you’ll be a master at this game, 1000 points will be an easy peasy for you. If you’d like any other in-depth guide, feel free to send me a neomail and i’ll try to write it for you guys, good luck!.